Tempting fall pieces are now emerging in store windows (see Zara sweaters and thigh-high suede boots), but I still groan a little at the thought of buying sweaters in August humidity. And let's not even talk about this new Christmas-in-Summer promotion I keep catching wind of. It's just wrong. Instead I'll get on the Back-to-School bandwagon with a little 34th Street Lady Foot Locker. Because suede thigh-highs aren't always practical on campus, it's important to stock up on some sporting goods basics. Neon! Sick of it yet? Nah, true 80's devotees will never tire of neon. 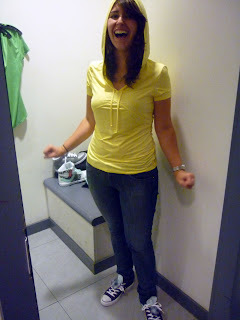 Here I like mixing the bright yellow (Calvin Klein Performance yoga hoodie, $39) with some bright purple Chucks ($50). Click and note the double tongue: fold it over for a little pattern detail. Love the plaid. 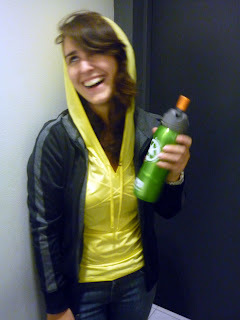 I made Kati pose with this green Nathan aluminum water bottle ($19.99, comes in several colors). Have you noticed water bottles are the new accessory round town? Plastic is over. Here's the Nike jacket from above ($50), but worn with a black Under Armour shiny T ($19.99) and a little variety on the feet. 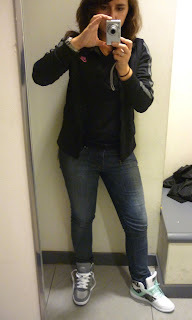 Kati and I agreed the jeans need to be tucked into the hi-tops, as this = 80's Rock Dressing 101. I call it a shiny T, but the Under Armour is really a heat gear training top. 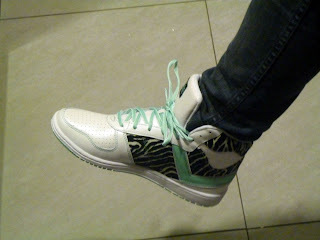 Still a perfect accompaniment for these Pony hi-tops (City Wings Cosmo Hi, $64.99). That light green and black retro metal pattern can only be described as "killer." I can think of no better adjective. Pay attention in English class, kids. 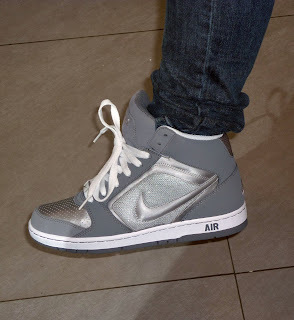 Then there's the classic Nike hi-top in grey and white and shiny (Air Prestige, $78). These shoes not only work the neutral grey trend but also mix up the texture with some sparkly silver. Chic, basic, and interesting. My favorites? Well, I'd be wrestling those retro Pony's away from you Back-to-Schoolers. Hey, I don't need to go back to school to buy a great pair of kicks. I want a neon yellow tank top right now. Where to find the perfect one? Love those shoes...reminds me of those shoes the dancers wear on So You Think You Can Dance for the Tabitha and Napoleon routines. High tops- I'm having a flashback moment! LOVE IT. I do love those kind of shoes!!! I have my own and I love! I saw yours, Kira, didn't you get them in NYC? love them on you! DS - I always gravitate to the hi-tops! Lipstick - no converter box, need to watch online!